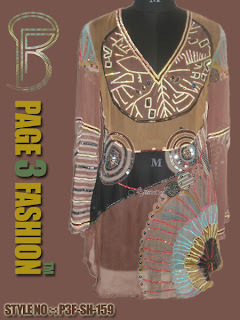 This beautiful and elegant top has an Egyptian look because of fabric print and embroidery style. Top has a perfect combination of black and different shades of brown. This top carries a luxurious feminine chic and grace. •	It will enhance wearer’s look in a comfortable way. •	Gorgeous prints and embroidery. •	Alluring top for resort, beach and excursion.